Can Ear Candling Remove EarWax Safely? Is It a Safe Way to Remove Earwax? Best known as an alternative approach for earwax removal, ear candling involves placing a hollow, wax-covered candle in the ear. Proponents claim that lighting one end of the cone creates a suction that pulls earwax out of the ear. How Is Ear Candling Done? Ear candles (also called ear cones or auricular candles) are hollow tubes that are approximately 10 inches long. They are made of cotton or linen that has been wound tightly into a cone shape, soaked in beeswax, paraffin, or soy wax, and allowed to harden. During an ear candling session, you lie down on one side with the ear to be treated facing up. The pointed end of the ear candle is usually inserted into a hole in a paper or foil plate (meant to catch any dripping wax) and then into the external ear canal. The candle is lit at the opposite end and held as the practitioner trims away the burnt material while the candle is burning. After several minutes (or when the candle stub is several inches from your head), the treatment ends and the ear candle stub is removed and extinguished. The outer ear is wiped clean with a cotton ball or pad. According to advocates of ear candling, the hollow cones create a low-level vacuum that softens and draws earwax and impurities out of the ear and into the hollow candles. After the procedure, a dark, waxy substance is sometimes left in the hollow candle stub. Proponents claim that the waxy substance is earwax and other debris, however, critics of ear candling contend that the substance that remains after ear candling is a byproduct of the candles. A study published in the journal Laryngoscope tested the theory and found ear candles did not produce a vacuum or negative pressure and that the waxy remains consisted of substances found in candle wax but not in ear wax. 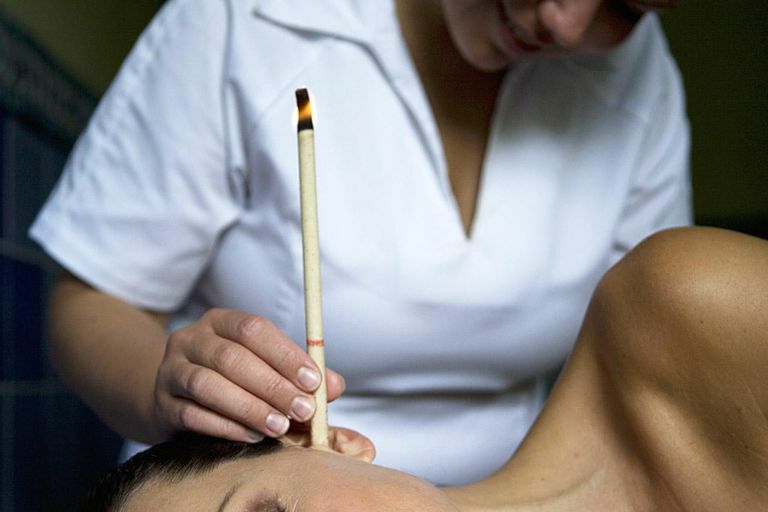 The study also found that ear candling did not result in the removal of earwax from the ear canal and even caused candle wax to be deposited in some ears. Some proponents of ear candling claim that ear candling can treat sinusitis, sinus pain, tinnitus, vertigo, and otitis media. The external ear canal, however, is separated from the middle ear, sinuses, Eustachian tube, and nasal passages by the eardrum (tympanic membrane). Other manufacturers claim that smoke from the burning candles dries out the ear canal and stimulates the body's natural excretion of wax and dead cells, pollen, mold, parasites, and other debris. There is no evidence supporting these claims. According to the U.S. Food and Drug Administration (FDA), using lit candles in close proximity to a person's face is dangerous and carries "a high risk of causing potentially severe skin/hair burns and middle ear damage", even when they are used according to the manufacturer's directions. The most frequently reported adverse effect of ear candling is a burn, either from the candle flame or from the hot wax. In a case report published in Canadian Family Physician, a 50-year old woman had pieces of candle wax in her ear, a perforation in her eardrum, and hearing loss after an ear candling session. The practitioner had spilled melted candle wax into her ear when attempting to remove the candle. The authors of the case report concluded that ear candling "can do more harm than good and we recommend that GPs discourage its use". People with existing tympanic membrane perforation should not try ear candling. Children and babies are at increased risk of injuries and complications. Some practitioners use the paper or foil plate to catch dripping wax. Some also use a towel or cloth for additional protection against any dripping wax. Even with these precautions, however, there are serious risks. There is also the risk that lit ear candles can start a fire. Should You Try Ear Candling? There is no evidence supporting the effectiveness of ear candling, and it can cause burns and damage to the ears and skin. According to the American Academy of Otolaryngology guidelines, based on the evidence, "Clinicians should recommend against ear candling for treating or preventing cerumen impaction". Earwax has a protective role. It cleans and lubricates the ear, and can protect the ear canal from bacteria and fungus. The ear has a self-cleaning system that naturally removes earwax. Most people do not require additional cleaning, however, a breakdown in this self-cleaning system can cause a condition known as cerumen impaction. If you develop an earwax blockage or are experiencing symptoms (like hearing loss or dizziness), you should speak to your doctor to assess your symptoms and discuss ways to safely remove the earwax. Jabor MA, Amadee RG. Cerumen impaction. Journal of the La State Medical Society. 1977:149;358-62. Roeser RJ, Ballachanda BB. Physiology, pathophysiology, and anthropology/epidemiology of human ear canal secretions. Journal of the American Academy of Audiology. 1997:8;391-400. Seely DR, Quigley SM, Langman AW. Ear candles - efficacy and safety. Laryngoscope. 1996:106;1226-9. Can Vitamin E Help With Scar Removal? Can Ganoderma Coffee Really Boost Your Health?